Steven McMillan received Bachelor of Music and Master of Music degrees in Violin Performance from Rice University's Shepherd School of Music. While there he was a three-time recipient of the Dorothy Richard Starling Award for Violin Study. His private violin studies were with Ronald Patterson, Concertmaster of the Houston Symphony Orchestra, and Eudice Shapiro, Visiting Professor of Violin from the University of Southern California. Mr. McMillan also studied at the Aspen Music School where his teachers included Karen Tuttle, of the Curtis Institute, Ruben Gonzales, Concertmaster of the Chicago Symphony Orchestra, and the legendary Dorothy Delay. Since Graduation from Rice University Mr. McMillan has performed with many of Houston's most prestigious arts organizations including the Houston Symphony Orchestra, Houston Grand Opera, Houston Ballet Orchestra, Texas Chamber Orchestra, and he has toured the US numerous times as Concertmaster of the Texas Opera Theatre Orchestra. In 1991 and 1992 he toured the orient as Concertmaster and soloist with the Mantovani Orchestra. He has also toured the United States extensively as the Assistant Concertmaster for Andrew Lloyd-Weber's Phantom of the Opera. In his orchestral career Mr. McMillan has been fortunate to work with many of the world's most renowned conductors including, Leonard Bernstein, Max Rudolph, Raymond Leppard, Sir Alexander Gibson, Sergiu Comissiona, Krystof Penderecki, Cornelius Eberhardt, Jersy Semkow, Stanislav Skrowachewsky, Milton Katims and many others. 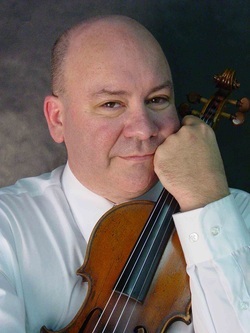 Currently Mr. McMillan is violinist of the White Oak Trio, Concertmaster of both the Victoria Symphony Orchestra and the Galveston Symphony Orchestra, and is Associate Concertmaster of the Corpus Christi Symphony Orchestra. Off of the stage he maintains a busy schedule of private teaching. Additionally as a patented inventor he oversees the manufacture and marketing of the SureTone Rest his own unique shoulder rest design for the violin and the viola. For more information, visit www.stevenmcmillan.com.